NVMe was a great thing to happen to SSDs. The per-IO reduction in latency and CPU overhead was more than welcome, as PCIe SSDs were previously using the antiquated AHCI protocol, which was a carryover from the SATA HDD days. With NVMe came additional required support in Operating Systems and UEFI BIOS implementations. We did some crazy experiments with arrays of these new devices, but we were initially limited by the lack of native hardware-level RAID support to tie multiple PCIe devices together. The launch of the Z170 chipset saw a remedy to this, by including the ability to tie as many as three PCIe SSDs behind a chipset-configured array. 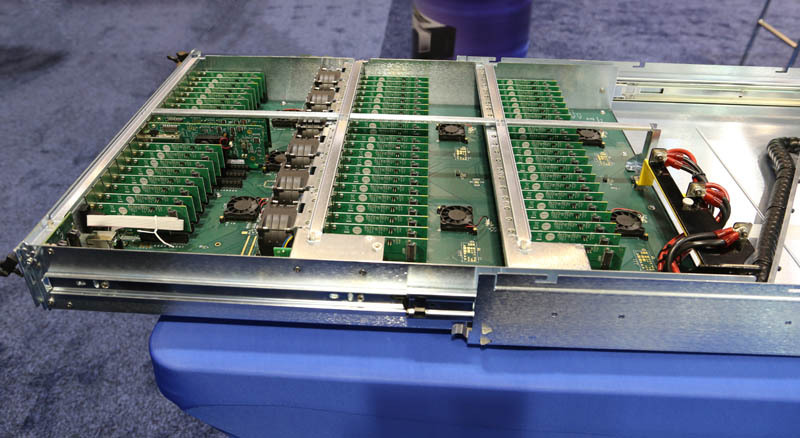 The recent C600 server chipset also saw the addition of RSTe capability, expanding this functionality to enterprise devices like the Intel SSD P3608, which was actually a pair of SSDs on a single PCB. 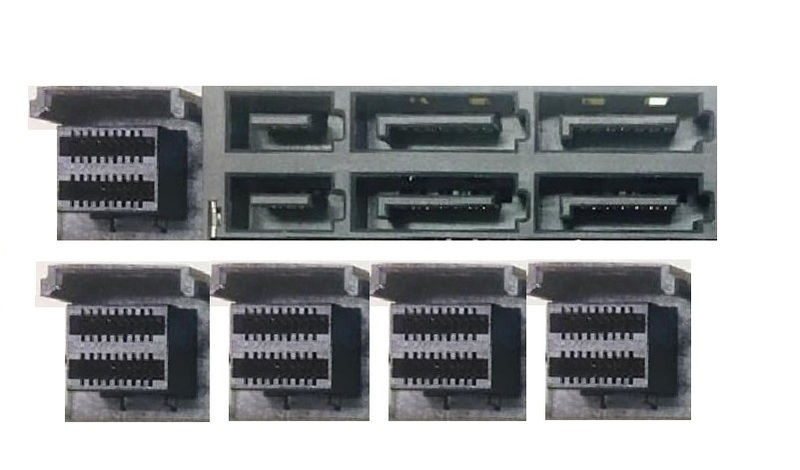 Most Z170 motherboards have come with one or two M.2 slots, meaning that enthusiasts wanting to employ the 3x PCIe RAID made possible by this new chipset would have to get creative with the use of interposer / adapter boards (or use a combination of PCI and U.2 connected Intel SSD 750s). With the Samsung 950 Pro available, as well as the slew of other M.2 SSDs we saw at CES 2016, it’s safe to say that U.2 is going to push back into the enterprise sector, leaving M.2 as the choice for consumer motherboards moving forward. It was therefore only a matter of time before a triple-M.2 motherboard was launched, and that just recently happened - Behold the Gigabyte Z170X-SOC Force! I have to hand it to Gigabyte for this functional and elegant design choice. The space between the required four full length PCIe slots makes it look like it was chosen to fit M.2 SSDs in-between them. I should also note that it would be possible to use three U.2 adapters linked to three U.2 Intel SSD 750s, but native M.2 devices makes for a significantly more compact and consumer friendly package. With the test system set up, let’s get right into it, shall we? Read on for our look at triple M.2 in action! Brilliant analysis on page 4, i'll be checking into this setup. Simply brilliant. $400 for a motherboard?! That's what I spend to build an entire system. I just don't see the value in it. Horses for courses. This motherboard was never meant to target the market sector that can do everything they need with a $400 system. Many of us want or need significantly more power and are prepared to pay for it. Try actually gaming on a high-end machine, or a machine that is running something that actually benefits from low-latency, high-IOP performance. Yeah, that's going to require you to spend more than $400 for a whole system. You're essentially trying to compare a skateboard to a supercar. Yeah those considering triple NVMe RAID are definitely in the serious power user category. I'm not sure, since I can't find proper Xeon boards with enough channels, I've only been able to connect one 512gb 950Pro to my system with 25 256GB 850Pro drives to as many dedicated SAS lanes as I could manage (not nearly enough). That's hosting the storage for my workstation which is currently 44 Xeon cores with an additional 32 in transit now. The system has a little more than 800GB of RAM and uses dual 40Gb/sec Infiniband as a host bus and 10Gb/sec internet uplink. Does this count as a power user? I didn't add any GPUs since I didn't have any need for them, but I'm considering adding a front-end device which hosts GPU as well. I am using this configuration as a part-time data center for hosting labs for courses, but normally, I just use it for programming and compiling code and experimenting. I suspect I'll be up to around 2TB RAM and 200+ Xeon cores before 2017. My goal is to do it in a single rack with absolute resiliency. I have 4U sucked up with 52 3.5" hard drives though. They're big and ugly, but 400TB of SSD is still too expensive. Oh that's certainly power user, but a different type of power user. Depending on the IOPS capabilities of the RAID cards you are using, this triple M.2 setup might be able to beat 25 SATA SSDs in some performance metrics. This board is a high-end model. It looks like the main feature is a PLX chip which converts the 16 PCIe lanes from the CPU out to 32 PCIe lanes. This allows all 4 x16 slots to operate at x8 with 4 video cards installed. You still only get x16 bandwidth to the cpu though. How many GPUs can you use when all 3 m.2 slots are populated? WEll, PLX isn't that great, its a stop gap until the Skylake-E's are out I wouldn't suggest it. Without it you would have 3 of these at 3.0 x4, so you would have x4 available for your video card. With the fast switching from the PLX you could do x16 and have x4 left over, but from every instance I Have dealt with PLX (mostly Z87 and Z97 boards) it is is not really even close to true 3.0 x16 performance. It only shows any returns when you have more than 4 cards installed. Personal opinion from experience, stay away from it. If you need the lanes go Haswell-E. This of course was for shiz and giggles, to see what they could push it to, but if this was a "real" build I would only use 2 950 Pro's and the GPU at x8 with a non-PLX board (if they have any with 2 M.2 slots). The difference between x8 and x16 is CURRENTLY negligible for gaming, might change with DX12. Both cases have the same amount of memory chips to distribute the load over, but in the raid case, you have twice the controller, is this the advantage? Reads will see the same type of boost as with 2x 512's. Writes will see the same effect / proportion scaling up from one to two 256's, but since the 256GB model has lower write performance to start with, two 256s will not beat two 512s. Even with the slower write speed of the 256GB model, a pair of 256s will still beat a single 512 in all but low QD (1-2) latency. Everything else will be better - higher sequential writes (~1.5x) and reads (2x), higher random performance at moderate QD, etc. Interesting, the real question is why though. Isn't an ssd controller not similar to a raid controller? I was thinking a single 512 would be able to distribute the load similarly as 2x256 would in raid 0. I think that is true when only considering the memory chips. So where does the extra performance of the 2x256 come from? The SSD controller will have a fixed number of channels. The 512 GB model just has twice the amount of memory attached to each channel. I believe Intel SSD controllers use 18 channels. I am not sure how many the Samsung controller uses. They wouldn't want to set up the controller to use half the number of channels with the 256 GB model since it would be effectively half the performance. You are not distributing across individual flash die, you are distributing across the channels of the controller. Twice the amount of flash die doesn't mean twice the performance. Double the number of channels can double the bandwidth though, if there is no bottleneck elsewhere. There does seem to be an effect on write with more flash die, even with the same number of channels. I don't know exactly how this works. What are the *practical* applications for this other than RAID1 for drive redundancy? NVMe's increased in bandwidth has little to no tangible benefits over SATA-based SSDs. The only real benefit is high IOPS for database interactions. Can we get application load times (OS, productivity and games), processing time analysis on video rendering, file compression/decompression, file copy, etc.? When can we expect real-world benchmarks? RAID-1 is certainly doable for a pair of drives, and RAID-5 would be the more efficient choice for three (we talk about that part on page 3). The effect of the reduced latency is faster response with a lot going on on the system (heavy loading, multiple apps hitting the array simultanrously). There is no existing consistent test using actual simultaneous launching of applications, so the closest we can come is with the testing we are conducting here. The reader will have to decide, based on their particular demand on their storage, how high they will be filling the queue (this can be monitored in Windows), if the reduction in latency is of benefit to them. I do have an extension of this testing that will also evaluate as the SSD is filled and TRIMmed, but for now the setup was random access to an 8GB span of a full SSD / array. For someone building a computer that'll mainly be used for gaming plus the usual everyday use scenarios, would the addition of a 950 pro provide a noticeably faster experience compared to a SATA ssd such as the 850 Evo or Pro? Other than the increased performance over synthetic benchmarks, you won't see any discernible and tangible differences. I bought the 512GB 950 Pro NVMe drive to replace my 500GB 850 EVO as my boot drive and Windows 10 and all my applications load just as fast. Loading games such as BF4, SWBF, WoWS w/ tons of mods, and anything in my Steam library loads about 0.2~0.8 seconds faster with the 950 Pro. Is it work the extra cost? YMMV, but for me it was not. I eventually put that 950 Pro to test against a 480GB Seagate 600 into my web and database server and found it to be worth it in there with the much lower latency on DB queries and the ability to have more concurrent connections. If you compare the read write figures for a SATA connected SSD against a M.2 SSD (Samsung Pro Evo in particular) either using a M.2 slot or a Pcie slot with an adaptor then you will find the PCIe NVME SSDs are more than three times faster overall. I have my OS on 1 X Samsung Evo M.2 and another two Evos (2 X M.2,s are on my motherboard) and another on an PCIe adapter card. ALL of the M.2,s regardless of connectivity perform at almost the exact same level. I also have 1x SSD drive connected via a SATA port for further storage. I play games on my computer and ALL of them are stored on my M.2's. If I had known how much faster PCIe M.2's were over SSD,s I would never have even bought a SSD in the first place. If you don't want to spend a lot of money to speed up your current computer without buying new CPU, MOBO, RAM, then invest in a PCIe M.2 connect either directly to the M.2 slot on the MOBO or if your current MOBO has not got a M.2 slot then buy an adapter for a few pounds and connect via a spare PCIe slot. Load your OS onto the M.2 and it will feel like you have supercharged your PC, load times from off to Windows will take about five seconds. use the spare capacity on the M.2 for Games and apps (Office for example). EVERYTHING you will do on your computer is SO much faster. I would never go back to physical hard drives and or even SSD. Just make sure that any M.2 you buy is PCIe because the SATA M.2's are no faster than SSD' s, although they are still 3-4 times faster than physical HD's. A very easy way to differentiate between PCIe/SATA M.2's is that PCIe M.2's have only one slot at the end of the stick and SATA M.'s have two slots. Maybe a long winded answer but M.2's (PCIe) are much much faster than SATA connected SSD's . To echo the other contributors, will this shave a few seconds off load times? Perhaps a few fractions of a second. why does one ssd appear to be upside-down? That was our first sample unit, didn't have the full retail sticker on it. Typo there, I think u mean "fit"
You messed up your graphs - you labeled the x-axis as nanoseconds, when it should be microseconds. Is the 6ns RAID overhead meant to actually be 6 microseconds? Crap, you're right! Corrections incoming! Thanks for the catch! Cool, thanks! Looks real good. Clearly not enough PCIe and m.2 ports. Joking aside, it seems kinda weird to be able to save physical space on a board that big which would most likely be put in a roomy case. Maybe because it is such an expensive MB meant for high end enthusiasts looking for options on builds and/or mods? Otherwise, very interesting review, great write up! One of the biggest benefits to M.2 in desktop computers IMO is that the mobo delivers the power. If you only use M.2 storage, that's one less power cable you need, and less clutter. yea, how do we hot swap those with the video card on top of them? Perhaps this is a silly question, but are the log scales for the graphs on page 4 labeled accurately? The scales jump from nano-scale (1e-9) to milli-scale (1e-3), but shouldn't the micro-scale (1e-6) be included in-between? If true, this would make the latency time reduction of running 3 drives in RAID only 1 order of magnitude instead of the 2-3 orders shown above. Yup, thanks for the catch, updating things now! Why is this prrsented as new, the ASRock FATAL1TY Z170 PROFESSIONAL GAMING I7 also has 3 m.2 slots. This was the first board we could get in capable of triple M.2. would be curious to see how QD and latency compare when running in RAID1 or RAID5 configurations. RAID-1 (2 SSDs): Reads are similar to RAID-0. Writes are similar to single SSD. RAID-5 (3 SSDs): Reads are ~ 2-3 SSD RAID-0 figures, writes are ~ 1-2 SSD RAID-0 figures. Be advised there is additional CPU overhead in RAID-5 due to parity calcs. Re: RAID1 reads are similar to RAID0... I'm surprised that it's not closer to single SSD... sounds like no integrity / validation among both disks? A common misconception. RAID1 typically does not read data from both drives and then compare to see if they are the same, it will divide the reads across both drives and use the sector CRC's to ensure data integrity and only then will it switch to reading the other drive for the bad sector(s). RAID-1 typically reads back data in 'performance' mode, meaning it stripes across the drives as if they were in RAID-0. No error checking happens here, but you can tell RST to 'Verify' the array, which will scrub both drivers front to back and compare data. Those are some pretty impressive iops numbers. This seems an ideal setup for a high core count, write intensive OLTP database system. I'm wondering about the DMI bottleneck though. I understand why putting the SSDs behind the chipset allows for UEFI-level RAID configuration. However, say that you don't want to use Intel RST, but instead rely on Linux' MD-RAID or Solaris' ZFS, then it would be better to have the m.2's wired directly to the CPU, no ? Then again, the question then becomes *where* you're going to get data to and from at a sufficient pace to keep that SSD array busy enough on a consumer level system like Z170. Interesting article. Thank you very much for taking the time to document and share your findings. Remember we were only writing randomly to an 8GB span of sequentially filled SSDs here. OLTP would randomly write to a much larger span of the SSD (if not all of it), so to get good sustained random write performance you will need enterprise SSDs which can better handle sustained workloads to 100% of the volume. (The latency principles still apply though). Moar IOPS = Lower Latency. Simple math. This totally does *not* apply when a queue is involved. For example, the OCZ R4 hit very high IOPS, but used SandForce SSD controllers in a RAID to get there, so individual IO latency was far higher than what we are seeing here. Allyn: You put in a ton of work on this. Thank you for sharing! My wife has been griping her computer is slow and I always get the "good" stuff for myself, which is absolutely true, lol. So I was looking at all the latest technology, and was really wondering about the RAID 5 aspect with the 3 each M.2 connectors. You answered the questions I had. I have been using RAID 5 exclusively for many years, and my wife's old computer (~8 yrs) has a 1.5 TB raid 5 C: drive, which always has to rebuild if the system locks down, which can take a day or more. Raid 5 still works, of course, but slows down considerably when rebuilding. So, I am a little paranoid about using raid 5 for the C: drive. I use a single SSD C: drive and a 3TB raid 5 D: on my own computer. Your comments about loading the system using a GPT external USB drive are crucial. I obviously am rusty on the latest bios settings terminology, but I have built my own computers for the last 20 years, one every 5 years with the latest stuff, so there is always a learning curve since I do it so seldom and technology changes. Your article helps a Lot. Thank You! I am about to build a triple M.2 RAID0 system using three 512GB Samsung 950 Pro's based on a Asrock Extreme 7+ motherboard. Has anyone here done this already? I am thinking of doing the same. How did that go for you - and what RAID level did you use? Great write-up! It was hard to get through some of the technical details but Allyn promised the next page was going to be amazing. I was expecting a free computer offer or something. For real though amazing details. Really excited about my next build! Great write up and interesting findings. But could future videos have higher depth of field? Only the background TV is in focus. We were trying a new camera for the video and we might not have had all settings tweaked properly. No Patreon needed on this one. After putting weeks of development work into creating this testing, I'll be using it on all storage reviews moving forward. Perhaps slightly out of context for this article, but can anyone comment on how this config would affect an SLI installation? I believe that 3 M.2's and multiple graphics cards will take up more PCIE lanes that are available in the Skylake architecture. so basically your SLI cards would be forced slower? Which would have priority to the PCIE lanes or is it all multiplexed somehow? This uses PCIe from the chipset. You will lose all of the SATA ports off the chipset to do this. This will take PCIe 15 to 26 from the chipset. The lower PCIe links are still available for USB, network, other controllers, and probably last PCIe slot. The graphics cards would be running off the CPU PCIe lanes connected to the x16 slots. I don't know if this board supports 3-way CrossFire by using an x4 from the chipset. That would run into bandwidth limitations due to the link between the CPU and the chipset. It isn't really relevant anyway. I am not sure what applications you would be running at home to really stress this set-up at all. What you'd you be running to stress this set-up and your graphics system at the same time? Actually, it is only 20 PCIe lanes from the chipset. The HSIO lanes 1 to 6 are USB3 only, while some of the 20 PCIe lanes can be switched to SATA. Using 3 x4 m.2 takes 12 lanes, leaving 8 lanes for other controllers or slots. It may speed up some more complex game loads, but where this would really shine would be the home user that has other disk-heavy processes taking place *while* gaming on that same system. "The end result result of this is a RAID of SSDs gives you a much greater chance of IOs being serviced as rapidly as possible, which accounts for that 'snappier' feeling experienced by veterans of SSD RAID." You like writing "result" apparently. While interesting as an exercise (I know only 3 ports) I find nothing short of sacrilege to suggest RAID5 setup on Flash based drives. If it was drivepool kind of setup then fine, but it's not. NVMe doing great in R1 or 10. There is no point wearing NAND with unnecessary parity writes (just like classic SSDs). Basically if you value your SSD all parity based Raid levels are out of the window. Even in enterprise environment SSD parity arrays are rarely encountered. And all of that with SSDs which cost 10-30x more than consumer grade drives. Simply 1 or 10 is much more convenient and easier&faster to recover. Time is money. Wearing out ssd's is not that big an issue anymore, these vnand chips have excellent durability. Modern SSD drives will run for years just fine under heavy RAID5. Plus with RAID, the real issue with failure is effect on cost over time (because there is no data loss with a single drive failure). And RAID5 is extremely cost effective, because you can get to, say, 1TB of data with only 3 500GB drives and still have parity. That compares favorably for cost with using 2 1TB drives in RAID1. The slight reduction in life from the parity writing is nowhere close to enough to offset that cost savings. Therefore, RAID5 should be a recommended configuration where expensive SSD cost is a chief concern. The biggest downside is that this board only supports 3 M.2 drives, the minimum (and least cost-effective per Byte) number of drives needed for RAID5. This also means no expansion capability, which is possible with SATA SSDs in RAID5. Boot of a 'clean' fresh install is essentially the same (or in some cases it takes a second or two longer due to different initialization of some BIOS when initializing NVMe devices during boot). Where the speed difference would be more seen is a 'well used' OS that has had a lot of other apps / startup processes / cruft generated over time. The additional SSDs would keep latency lower during the increased load seen during that boot. Still, we are talking a few seconds time, and that only happens while booting, which is a rare event (and why we don't focus on that aspect). Why cant M2 slots be at right angles to the motherboard ?This would save space and allow better airflow and use less space. I could possibly see myself getting two m2 in raid0 at 120gb rather than a single 240gb.It would be interesting to see results of windows raid also, which has been flawless in my system (win7 ). I think there was a few boards that did that; maybe some ASUS board if I remember right. It is a little more expensive since you need a metal bracket to support it. For RAID 5, can you test with a LSI controller? I'm sure that the onboard RAID controller will be the bottleneck calculating the parity. LSI RAID controllers handle SAS / SATA. These are PCIe NVMe. The ASRock Z170 OC Formula and Extreme 7 both also have triple M.2 and are around half the price. They've been out for some time now. You should check them out to see if they have a same or worse RAID implementation. The RAID implementation is in the Z170 chipset, so it should be exactly the same. It does have some hardware acceleration, but it doesn't seem to have hardware parity calculations. It would be cool it they could make a PCIe x16 RAID card that can handle 4 of these SSDs. No home user needs such a thing though. This specific board is probably really expensive sinxe it has a PLX chip to convert the x16 PCIe connections from the CPU out to x32. This allows for 4-way SLI with x8 PCIe to all 4 slots. Not really, as that type of use would be full span random writes, which would slow these consumer SSDs down considerably. You need enterprise optimized firmware for that. In the video, you mention that "advanced" users could see up to QD=8 . But, everything I've read says most users don't go past QD=2. What exactly makes users go to higher queue depths? Like, is downloading a file + gaming going to increase your QD? Each individual thread (program) that hits the storage will add *at least* one to the QD figure. Apps can individually ask for multiple sectors at the same time, or can 'ask ahead', which builds the queue. A simple windows file copy can run at QD=4 with nothing else going on. QD can spike past 64 on a powerful, multi-core system during boot where dozens of other apps and services are simultaneously launching. Note: SATA devices can't exceed QD=32, so if the OS climbs higher, the queue backs up into the OS itself, no additional benefit will come from a SATA SSD (since it can't see further ahead than the next 32 requests). Great job as usual Allyn, excellent info and methodology. I have one of the 950 pros and had to use an Asus Hyper X4 riser card on my X99 because the native M.2 are worthless 10G slots and that's when it dawned on me that I wouldn't be able to do RAID with M.2 because the rest of my PCIe slots are occupied. What we REALLY need are PCIe x16 riser cards that can support up to FOUR M.2 2280 cards for either RAID or JBOD, but the most important thing is it consolidates space and slots which is a problem now due to the way M.2 are routed with HSIO since they need to work individually or in tandem. Do you have any info on this from industry OEMs? An x16 riser card that could take 4x M.2 would be awesome! > An x16 riser card that could take 4x M.2 would be awesome! with four M.2 @ x4 PCIe 3.0 lanes = x16 PCIe 3.0 lanes. 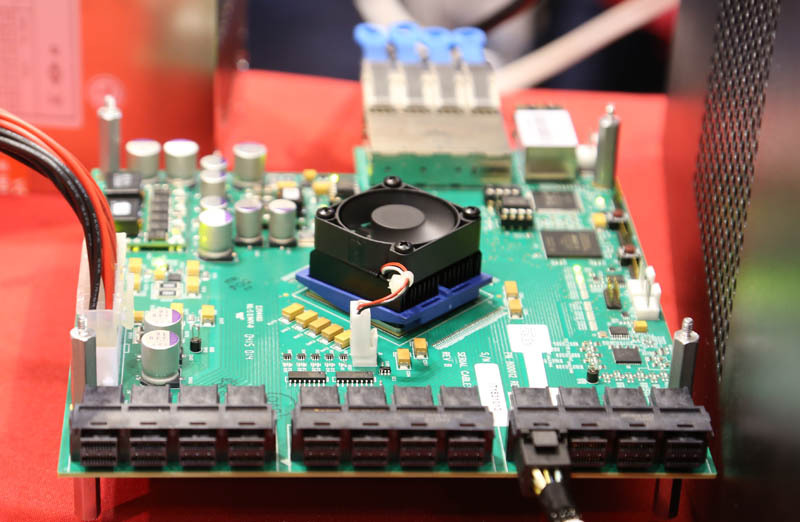 discrete devices in a single PCIe expansion slot. but the HP version requires an HP workstation. Google "Cheap NVMe performance from HP"
with 4 x U.2 ports? There's certainly enough room. x4 PCIe 3.0 lanes @ 8 GHz / 8.125 bits per byte). as the upstream bandwidth of the DMI 3.0 link. directly by any Intel CPUs, as far as I know. possibly confirm or update any of the above, please? issues, so as not to mislead anyone else. Do keep up the brilliant work, Allyn. RSTe (c600 / x99 - driver only, not bootable, no bottleneck but additional CPU overhead). There is an HP Z Turbo Drive that supports up to 4x M.2, but it is current not clear (and unlikely) if it is performing hardware RAID of NVMe devices. rather than via the DMI 3.0 link? the 4.0 GB/s bandwidth ceiling of the DMI 3.0 link. e.g. x8 PCIe 3.0 lanes @ 8G / 8.125 = ~8 GB/s. so you can do a scaling experiment. work in the primary PCIe 3.0 expansion slot? Yes, a PCIe x8 RAID card can exceed DMI 3.0 (4 lane) bandwidth, but you are adding a bunch of latency and a lower maximum cap on ultimate IOPS that the RAID controller can handle. Intel RST (SATA) actually beats most add-in RAID cards as far as IOPS scalability goes. It would also not be able to communicate to the host via NVMe, so there would be the same sort of IO overhead seen with SATA. It's basically the long / expensive way go reach those high figures. Many thanks for your very prompt replies above. Keep up the great work, Allyn. "Thanks to a BIOS lock, the device is supported only on the HP Z440, Z640, and Z840 Workstations, and cannot be used in any other OEM workstation solution." Would the Windows 10 Pro USB flash drive work for OS installation with this configuration (is it GPT formatted)? note where it says "requires no additional software". with four U.2 ports, just like that Host Adapter. if we remove the SATA-Express ports. with three M.2 SSDs installed, will my graphics card run at x8? Also to clarify this, I will have two SATA ports available for any optical or HDD or SSD to add further on? Got my answer from the comments of the Video. with the performance numbers they reported. I plan to build a high end gaming computer for iRacing.com use. It seems to me that 3 m.2's in Raid 0 are not going to increase my FPS, though it may help with load times from the sad's to memory for tracks and cars. Also, isn't Raid 0 a bit unstable? If there is any sort of memory error on either SSD won't that lock up the OS? Even 2 SSD's in Raid 0 doesn't appear to add a significant advantage for my system. Great discussion, article and video. I learned a great deal. Excellent coverage of triple RAID NVMEs.. I'm looking for a microATX board with dual M.2 slots for RAID. Any available to your knowledge ? I wonder how this will fare against the upcoming Intel Optane SSD. Will it still take a good chance? I have a question for you guys. I bought 3 950 PRO M.2 SSD. I want the best performance in my PC so which motherboard and processor should I buy. What is the best option for me? I plan to install one or two graphics cards in SLI. I worry about full data loss running on RAID0 if one of the SSDs fails. Can you do RAID5 with the 3 m.2 slots populated, and do you have any performance #s? So in the video around 9:20 are you saying that the "snappiness" of adding more SSDs is similar to hyper threading for Intel processors? The workload gets spread out across all drives. I set about building a PC for video production and the top priority was HDD speed in order to capture up to raw 4k. In my search I found this great review and it convinced me to go with this motherboard and (2) 950 SSDs. I put all my faith in RAID0 because I backup regularly and archive to RAID1. My downfall was that I also used the RAID0 as a boot drive. I am now re-installing windows for the 3rd time, but learned my lesson this time and using another SATA drive for my boot device. The problem I discovered is the BIOS will decide to reset CSM to enabled which in turn disables Intel RST and breaks the RAID. The first time was my doing when I installed a video card that did not support UEFI. The second time was after not using the PC for a week. After booting up, my RAID was marked as failed. Checking the BIOS and it decided again to reset CSM to enabled for what reason I do not know. The only option was to delete the RAID and create a new volume. This does not recover the drive contents, but I found a utility that let me recover the partitions and get my data, but it still was not bootable until a re-install. Does anyone know of a way to lock down that CSM so it will not change on its own? What do you think of the idea of configuring your system so that you're booting from a regular SATA SSD, pointing your NLE software cache to a RAID 0 of 2x M.2 950s, employing the third M.2 950 to hold all of the project source files (raw video, audio, and media, and finally, having 2x HDDs in Raid 0 to catch the transcoded video files? Or... this is more straightforward: one m.2 for cache, one for source, and one for the target. I do video editing also. After my multiple RAID failures, I reconfigured my system to use one SATA as the boot drive, two M.2 as RAID0 for capturing and temporary working drives, then another SATA to move completed work to. I lost trust in the M.2 drives as RAID0 (more so in the BIOS), so nothing important stays on those drives prior to shutting down. I did discover something interesting while working with different configurations. When I first installed the two M.2 drives, I put them in two adjacent slots. This defeated a majority of my SATA ports. I did some research about theshared hardware on the motherboard, then moved the drives to the outside M.2 slots. This gave me use of faster SATA ports. I love being right despite being a newb~. a; simple, cheaper, raid0 nvme pair, & very conceivably, a 4GBps read AND write storage~ resource that u just gotta have - but dont be dumb and complicate things by making it a boot drive. leave what aint broke alone (or boot on the system/mobo nvme), add this awesome discrete raid 0 resource to u pc, and find ways of profitably using it, just as you have done sir. The raid array is not something u can pluck from u system and confidently run on another pc, like a sata drive can. Its a great scratch file tho, as u say. I am using this motherboard with 3 950 pro's in raid 0 can i use 2 samsung 850 pro in raid 0 with the sata ports as well? I'm trying to find the best (value) high power setup for 3D content creation. I'm thinking the i7-5820k is the best value and I want as fast as possible application startup/speed so it sounds like a couple 512G 950 Pros in RAID0 would be the best option (also considering RAM disk). I'll be using a GTX1080 as soon as the price settles down :). Is this motherboard the best option for 2x 950Pros in RAID0? Am I gaining significant performance in application startup/speed with such a setup or is a single 950 Pro adequate? Thanks!! I'll check out the Asrock. Sounds like exactly what I'm after. Do you know if setting up 2 512G Samsung 950 Pros in RAID0 is pretty straightforward with the Asrock? I'm not very knowledgeable about PCI lanes and all that so I'm hoping I just plug in the drives, configure the BIOS and I"m done! Thanks much for the info! Where I see this being useful is in a VMware lab, using the 3x m.2 cards to be the caching tier of an all flash vSAN nested on one box with extreme performance would be incredible. what drivers were used on the OS side, intel, samsung or a mix of both? Used your guide to do a triple m.2 raid 0 stripe on my gigabyte z170x soc force motherboard, as the boot drive. Worked great, super fast, until I updated the bios now it tells me "reboot and select proper boot device or insert boot media in selected boot device and press a key". I committed the ultimate sin and do not have a backup of my drive. I don't want to lose my info. Is there any way to fix this? By re doing the raid 0. MSI claims double performance up to 64Gbps with M.2. I tried Raid0 with Intel RST and I get the same results as you.. maxing out at about 25.6Gbps. Any idea what MSI is talking about or how to go beyond 32Gbps? Maybe I should try running them both as single drives simultaneously, or do software raid. The configuration in this article is not the fastest RAID setup possible. The CPU has too few PCIe lanes. You need a 40 lane CPU (Enthusiast line). While I cannot boot from it, I have three Samsung 951 AHCI drives in Windows software RAID 0 and I get 6.6GB/s sequential read seed. My system boots from a fourth M.2 drive on the motherboard's M.2 slot. All my software and games are installed on the RAID volume and all have very short load times. Yep, i couldnt be fagged re-reading, but it didnt look like each drive was getting plenty of pcie3 1GB lanes to me either. But an 8x pcie3 lane 2 x m.2 socket adaptor & an 8 lane pcie3 gpu is doable on ~any pc, yielding ~4.5GB read and WRITE from a raid0 pair, judging from your results. The latest samsung 500GB drives individually max out at 3.5GB~ now, so speeds are now dramatically improved. And guess what, they also solve the thermal throttling issue at the same time. This would be an awesome system for my Oracle 12 Enterprise Database!!!! The hard yards have been covered using a raid0 pair. 3 is dubious value for most - an increment in queue depth & heat benefits. The killer advantage of raid0 is write speed. At 32kb+ block size (as per above charts), write goes from being the half as fast laggard, to ~as fast as the (much improved) raid0 READ speed. i hear rumours that ssd is v reliable, & the risk of raid 0 is far less than is historically perceived. Impressive as they are, None of these results maxes out the 4GBps bandwidth of a mere 4 x of the PCs scarce pcie3 lanes. So, a 4x pcie3 lane card w/ 2 x ports for r/w speeds of 4GBps in raid 0 would be a boon - a magic number. Software raid on 8C cpuS should be fine. This was an amazing video. Super good stats and graphs on speed implications of a board with this many m.2 slots and effects of RAID on those. Very helpful for my next purchase!